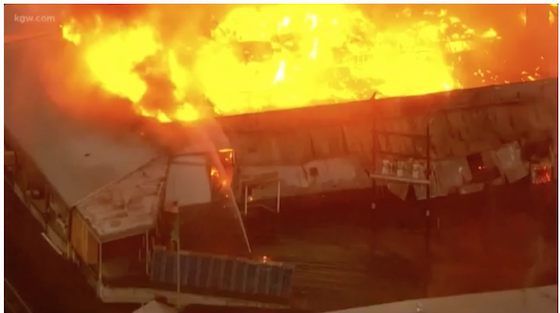 Flames erupt from a fruit processing plant in Bingen, WA. Huge flames consumed part a fruit processing plant in the Columbia Gorge community of Bingen, WA. The 5:45 a.m. fire Oct. 18 at the Underwood Fruit and Warehouse Company plant caused some power outages in Bingen. The fire also affected some morning school bus routes. Klickitat Public Utility District said the fire caused 600 power outages in the area. They said the flames burned a conductor line that serves homes in Bingen and White Salmon. In addition, students at area schools were kept indoors during recess due to air quality concerns. Arriving fire crews quickly put out a call for backup. Officials thought the fire was out, but flames flared up again during the night. Underwood Fruit and Warehouse packs and ships for 55 area growers, according to the company website. The company was formed in 1917 by seven local growers. Three pear warehouses appeared to be destroyed. An apple warehouse was spared, said Chief Executive Don Gibson. He said no one was in the buildings where fire broke out. The company employs about 270 workers at the site. Gibson said neighboring operations may allow them to operate in off hours, allowing some workers to return to work. Gibson said the cause of the fire is under investigation. The fire broke out when the packing company is at peak inventory with picked fruit, he said. Gibson said the company is insured and growers’ losses will be covered. He said inventory details aren’t available yet. Firefighters said everyone made it out of the building safely.